Milwaukee's RiverWalk is a three-mile pedestrian walkway and river trail that runs from the south end of Riverwest to the lakefront along the Milwaukee River. Most of the RiverWalk spans both sides of the Milwaukee River. 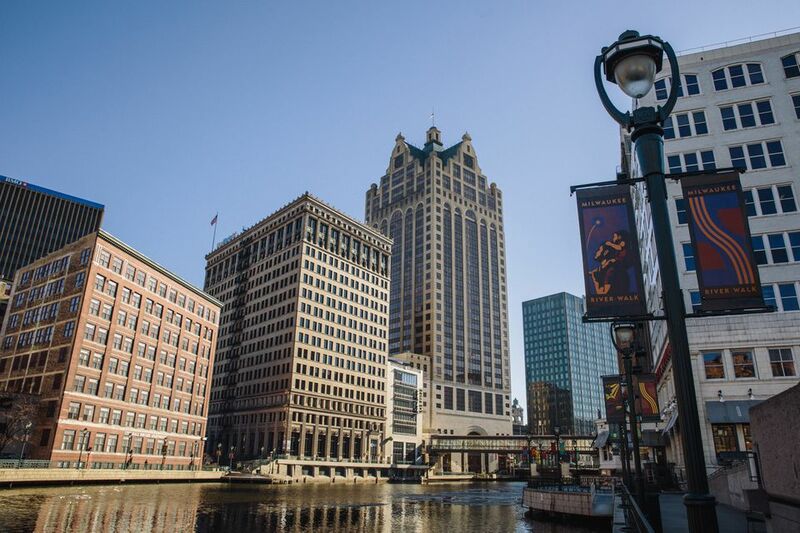 The RiverWalk has played a role in the revitalization of Milwaukee's downtown, which over the past few decades has been turned from an industrial corridor to an accessible and popular area for recreation, nightlife, performing arts, and dining. The RiverWalk also features many art installations, including a giant steel ring decorated with bowling ball "bling" by artist John Ready (located at Mason Street) and Acqua Grylli by Beth Sahagian, a rather fierce mermaid and river guardian (between Wells and Kilbourn). And we can't forget the Fonz: In 2008, a statue of Fonzie, of Happy Days fame, was installed on the RiverWalk. The ​Bronze Fonz is a popular photo spot for visitors. Today, the RiverWalk is home to several restaurants and breweries, many of which utilize this valuable riverfront area for warm weather seating and outdoor dining. China Gourmet, 117 E. Wells St. The Harp, 113 E. Juneau Ave.
Milwaukee Ale House, 233 N. Water St.
Molly Cool's Seafood Tavern, 1110 N. Old World Third St.
Pier 106 Seafood Tavern, 106 W. Wells St.
Riverfront Pizzeria Bar & Grille, 509 E. Erie St.
Rock Bottom Brewery, 740 N. Plankinton Ave. RIVALRY, 233 N. Water St.
Soup's On, 221 N. Water St.
Stir, 112 W. Wisconsin Ave.
Water Buffalo, 249 N. Water St.
Three destinations on the RiverWalk serve as docks for Milwaukee's River Cruise lines. Sports enthusiasts can also rent kayaks and canoes for Laacke & Joys outdoor sports store, located at 1433 N. Water St. on the Beerline B section of the walk. The RiverWalk is also a great location from which to watch the annual Milwaukee River Challenge, which happens annually in Mid-September.